Frequently I start a post and have no idea what I am about to write. Today that has never rang truer. As the words unfold we both will experience something new. First, I do feel obligated to address my absence. I prefer to keep the details private, a few close friends and bloggers know. When I last wrote two months ago I had been through a rough patch. I had written “…today is a better day and the future looks bright and promising.” This was true – until the other shoe dropped. Let’s just say this has not been my year. Yes, it is health related. No, it is not terminal. Yes, it is painful. The resolution remains a blur, but I am beginning to gain focus. A common subject I write about is finding joy in every day. The past two months have challenged me on this, but I continue to believe there is joy in even the darkest days. Second, I am able to train – or shall I say workout? Training conjures images of a race that I am preparing for in the future. While there still are three races I am registered for, getting to the start line is part of the blur. I truly am living one day at a time now. Swimming and running I am able to do, although with a few limitations. Cycling, unfortunately, has been confined to a spin bike. Weight lifting and resistance training are shelved for now. I am grateful to be able to sweat, get my heart rate up, and release those wonderful endorphins. Third, my friends continue to amaze me with their awesomeness. It would take a months worth of post to explain how awesome they are to me. I am blessed. Well – there it is. My post. Any more and I will go from misty eyed to falling tears. I miss writing. My motivation is returning. I hope to be back to my regular writing. As with endorphins, writing releases happiness in my brain. Before signing off, I do want to share some of my joy. I have written many times about my running coach (and dear friend) but never mentioned her name. Well, Heidi has entered the blog world and I want to share her awesomeness with you. Her blog is Heidi Jo Green and I am plugging her purely out of the love in my heart. She is getting her blog up and running and soon you too may want to seek her as a coach! Thank you all for reading, I have missed you. 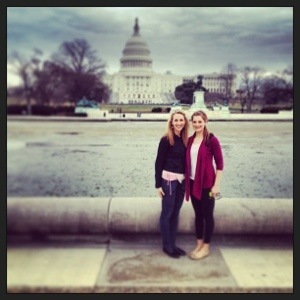 With Heidi at the Rock and Roll Half Marathon DC in March. We missed you too sparky. Welcome back. I have a funny feeling (I’ve found this about myself in fact) that you’ll come back a lot faster than you think. I went from no long rides to coming up on three centuries in three weeks, and a whole lot faster than last year… Granted I didn’t take time off, but I truly believe that our bodies “remember” and snap back a lot faster. Either way, I wish you luck (but you already knew that). Awe, Jim, thank you! I sure hope I respond as you think! I wish you a speedy recovery and hopefully the worst is behind you. Glad to see you back. Missed you! For whatever reason, glad you’re back and your voice is no longer silent! Thank you so much! You comment really means a lot to me. I don’t always realize who is out there reading. Its great to hear from you again. Stay strong and good things will come. We are all here to help as much as we can and look forward to reading more.